Looking for another great dip? One that’s guilt-free and a bonus of health benefits? Here is a great hummus recipe for everyone. All you need to do is put all the ingredient in a food processor or mixing bowl and process them until you reach a smooth consistency. 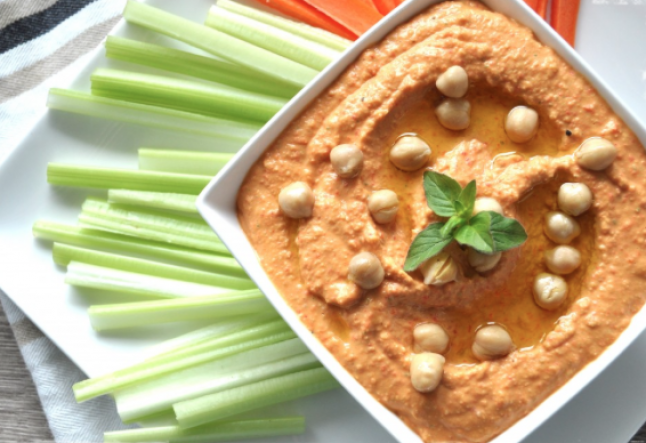 The main ingredient in hummus, chickpeas (or garbanzo beans), are high in fiber, which helps to prevent constipation and other uncomfortable digestive problems. Due to thishigh fiber content and its low glycaemic index (the carbohydrate in them is broken down and digested slowly which helps to control your appetite), chickpeas are excellent for weight loss diets as well. In addition to their bright colour, roasted bell peppers are low-calorie (25 calories per serving), packed with flavour and great antioxidants (vitamins A and C). Their sweet taste and velvety texture makes them a perfect fit for hummus!